Sunday’s traffic at the 4th of July Strawberry/Pine show turned out to be a little slower than Saturday’s and by late afternoon Lisa and I were starting to think ahead to the drive home and which route we would be taking when a familiar face appeared in front of my tent. Karen Custer-Thurston of Flagstaff completely took me by surprise by stopping by on her way back from picking her sister, Melanie, up at the Phoenix airport. 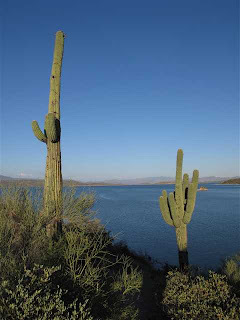 Melanie used to spend quite a bit of time in the Payson area and wanted to drive through on the way to Flagstaff. Thanks Melanie! So with a delighted girlie squeal, I jumped up from lounging in my chair and threw myself on Karen. Lisa was right behind me. In fact, I think I heard her utter the same girlie noise. We had a 30 minute visit with Miss Karen and Melanie; it made my day, my weekend, my week. Lisa and I have the packing and loading thing down and once 4 PM rolled around were quickly on the road home to Tucson. We decided to avoid the section of freeway between Payson and Mesa that was masquerading as a NASCAR track and headed the back, back way through Roosevelt Lake, Globe and Oracle. Lisa suggested it and I just went along for the ride. (heh) But she was right as we were one of the only cars on the road for most of the drive. Lisa humors me on our drives and assuming we aren’t completely late for an event, will stop when I casually point out “that would be a great photo”. 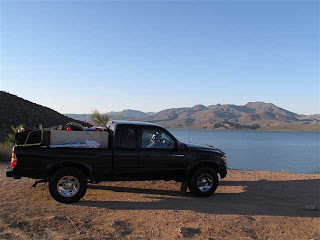 So at my Roosevelt Lake “that would be a great photo” Lisa found a parking spot so I could do a bit of picture taking. 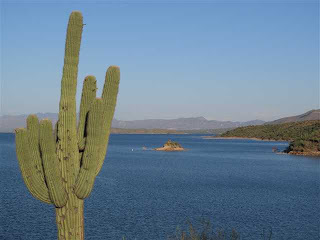 A saguaro with a lake background… you gotta’ love the diversity of Arizona. BUT the best was yet to come, and I don’t mean driving up into the driveway of my house to fall into bed. Midway between Roosevelt and Globe I caught a flash on the rock outcrop above us as we topped one ‘mountain’ pass. My cry of “BIG HORN SHEEP, BIG HORN SHEEP” startled Lisa for only a moment. The u-turn executed at the cry of goat milk cheese looked like amateur hour compared to the u-turn Lisa pulled just then. Loaded truck, narrow road, other cars, nothing stopped her. We got (safely and quickly) back to the spot I had seen the sheep and looked up hoping against hope they hadn’t backed up from the edge of the cliff and disappeared from sight. 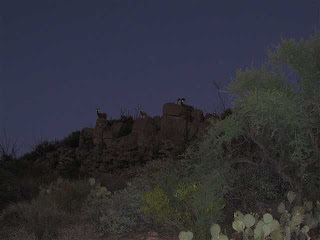 And there they were … 4 big horns; Mom, Dad and 2 babies. They were magnificent. Mom was a bit more nervous and ducked out of sight within moments of us stopping below them. But, we had about a minute or so of watching Dad and the babies before another car came up the road and we had to leave. I only managed a few photos, in my excitement I didn’t turn the flash off and due to the lighting the camera wouldn’t quickly fire off a shot. So I managed only 3 decent photos before we had to leave. There was a little motion from the dad on my favorite photo, so there is a small movement blur on his face; but you can see the curve of the horn really well in addition to the 2 little ones peering inquisitively at us. Not bad for such a distance shot: they had to be 30 - 40 feet above us. So of the many, many photos taken over the 4th of July weekend I will be printing only two. 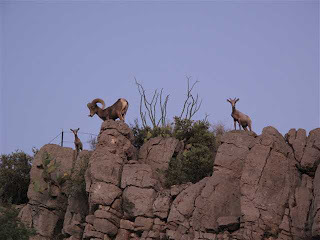 Both posted above: the saguaro lit up with the rays of the setting sun against the backdrop of a brilliantly blue lake and mountains in the distance and the close-up of the 3 big horn sheep - dad and 2 babies, silhouetted and peering down at us, with the cliff face stark against the fading evening sky. I have many more shots from the trip for stock photography so if you need any photos of old barns, pastures, donkeys, cows, flowers, gates, goats, etc. let me know. As most of you know, my fine art prints are un-edited aside from the occasional cropping. For the purpose of posting to this blog the photos have been resized and the quality reduced. Can’t have people saving and printing the photos themselves. With the tiny size of the photo posted and at the resolution used, even a small print wouldn’t come out. Not that any of my readers would do that. I have fantastic prices so please let me know if you would like to order a copy, or two or three.